A few months back, we looked at a casting optimization design study we recently completed with our friends at Wisconsin Precision Casting. In that study we used our Click2Cast and Inspire simulation tools to investigate where the real costs for a foundry are and how we can eliminate them? Today I’d like to discuss Inspire in more detail and where it fits in the design process and look at some specific use case examples. Inspire being such a robust solution – it’s unlikely that I'll be able to tell the full story of its value and capabilities in a single entry. So, I'd like to set the stage for multiple blog entries. Bringing simulation to design tools has opened up the technology to a much wider user base over the last two decades. While “Simulation-Driven Design” certainly has a nice ring to it, the reality is we have been practicing “Design-Driven Simulation.” I have seen the progression of computer aided engineering tools (CAE) from the specialist-only domain, not quite punch cards and analog computers but still lots of time spent in a text editor, evolve to much more polished readily accessible tools built into our design packages. What time we choose to use simulation capabilities in the product development process is a big factor in the value returned. Engineers and designers are often deep into fillets and drawings before verifying design performance. Having designers perform upfront screening simulation is still more efficient than the traditional paradigm, where all simulation goes into a dark room full of engineers typing away and we have had to wait a few days to weeks for results. But what happens to the design progress in the meantime? When given time and resource it's great to pair up a CAE geek and the designers. One of my favorite parts of being a CAE specialist is when I got teamed up with a good designer and we would have the opportunity to get a jump start on a project combining their smarts and my ability to run some quirky software. On the other side of the spectrum the CAE to design communication is a pass/fail grade and a presentation with a few pretty contour plots. The design team generally has a deeper understanding of the bigger picture. Because of this initial simulation studies done while in early packaging and layout phases more valuable. For example, designers are less likely to add a rib that won’t fit in the packaging space or can’t be drafted or easily generated. 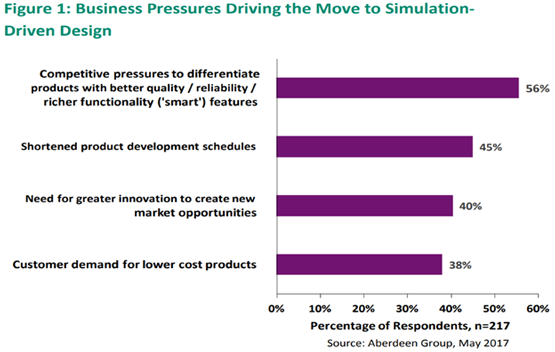 The engineering community seems to agree, in the Aberdeen report, “The Benefits of Simulation Design” points out that best in class companies are pursuing simulation-driven design for differentiation and shortened development cycles. However, using them in a “design it then analyze it“ fashion takes two steps forward and one step back. Even when using CAD embedded tools I have literally spent years of my life removing and tweaking geometry to run simulation studies. The gist is … we want to place analysis as early as possible in our design process while the cost of change is low and our investment in time is minimal. Best in Class Companies use Design Based Simulation Analysis Tools. I am a big fan of easy to use CAD-embedded analysis tools. However, I am also a big fan of optimization tools that wrap smart algorithms around the physics solvers. Easy to use and optimization used to be incompatible terms. 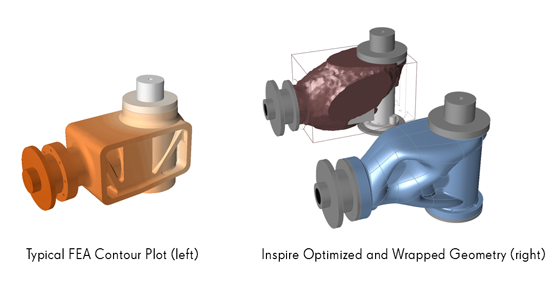 This is no longer the case with Inspire as a designer-enabled optimization tool that takes the simulation process one step earlier in the development phase. It’s safe to state that the earlier in the development phase we acquire knowledge about our designs the larger the value of that information. Now that we've understood Inspire's role in enhancing the design process, look out for my next blog that walks us through an actual an example of how the Inspire design process works. In the meantime, if this blog has peaked your interest about Inspire and you'd like to join us, we’re offering a hands-on workshop to show you how Inspire is driving the entire design process. Register today. Also, don't forget to check out our Manufacturing Video & Resource Library for other related content.